All our dishes are prepared using the finest monk fish (unless stated) which is a white meat fish with a very delicious taste and texture. (Please note: Fish dishes may contains small bones). Cooked in thick medium sauce. All our dishes are prepared using the finest monk fish (unless stated) which is a white meat fish with a very delicious taste and texture. (Please note: Fish dishes may contains small bones). Pieces of salmon cooked with fresh garlic, green chillies & tomatoes. All our dishes are prepared using the finest monk fish (unless stated) which is a white meat fish with a very delicious taste and texture. (Please note: Fish dishes may contains small bones). 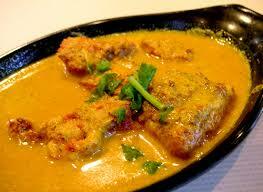 Pieces of salmon prepared in mild creamy sauce.